Shawn Tumulty has managed this fund since December 2003. This Franklin Templeton fund was incepted on November 1996. This fund has 1.13% expense ratio per year. The minimum balance to invest in this fund is $1,000 for brokerage account and $250 for IRA account. This fund can be purchased from 108 brokerages, such as JP Morgan, Scottrade Load, Merrill Lynch, Vanguard, TD Ameritrade Inc, DATALynx, Pershing Fund Center, Schwab Institutional, E Trade Financial, etc. This fund will focus on recognizing value that other investors might ignore. The fund will try to deliver solid, risk-adjusted returns, year over year during the long term period. The Mutual Series' consistent, deep-value approach has benefited shareholders with long-term investment horizons for the past 30 years and more. The fund will use the Opportunistic Value Investors approach. It will try to think and act like company owners when investing. The fund will try to reduce risk of its asset investment. This Franklin Templeton fund has returned 12.35% over the past one year and 6.06% over the past ten years. The best performance of this fund was achieved in 2003 with total 1-year return of 29.99%. The 5-year average return of this fund is 4.91%. It has 12 years with positive performance and 2 years with negative return. TEQIX has a 3-stars Morningstar rating. The other classes of this top international equity fund are Class B (Ticker: TEBQX), Class C (Ticker: TEMQX), Class R and Class Z (Ticker: MQIFX). As of May 2011, this TEQIX fund has 199 total holdings. 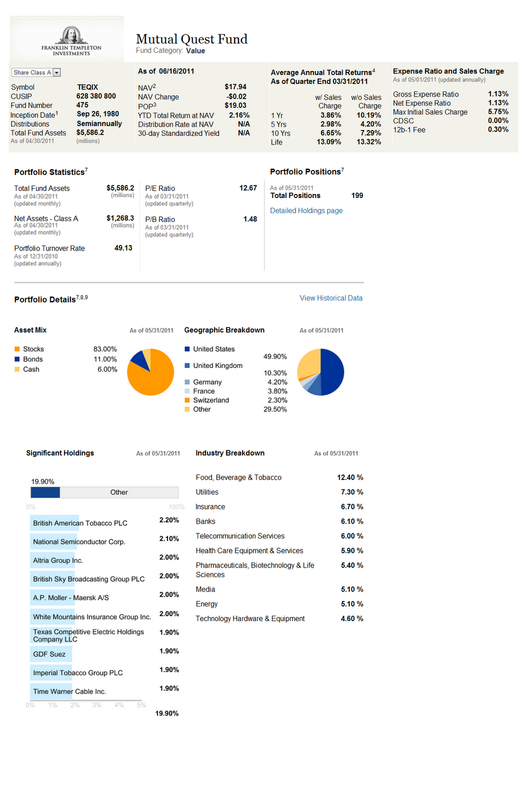 As of May 2011, the asset mix of this TEQIX fund is 83.0% in stocks, 11.0% in bonds and 6.0% in cash. The top 5 industry breakdown of this fund is 12.40% in Food, Beverage & Tobacco, 7.30% in Utilities, 6.70% in Insurance, 6.10% in Banks and 6.00% in Telecommunication Services. The top ten holdings of this fund represent 19.90% of total net assets. They are British American Tobacco PLC (2.2%), National Semiconductor Corp (2.10%), Altria Group Inc (2.00%), British Sky Broadcasting Group (2.0%), A.P. Moller – Maersk A/S (2.0%), White Mountains Insurance Group Inc (2.0%), Texas Competitive Electric Holdings Company LLC (1.9%), GDF Suez (1.9%), Imperial Tobacco Group PLC (1.9%) and Time Warner Cable Inc (1.9%). Investing in this world stock fund involves risk such as market risk, foreign securities risk, small and mid sizes companies risk, value style risk, etc.